In the last post, we talked about how parents' relationships with each other can influence their babies' behavior. When parents are frustrated and angry with each other, babies can be affected both by the stressful environment and by their parents' lack of attention to their early cues. We also described how easy it is for new parents to be frustrated, given how hard it is to care for a child, especially those first few unrelenting weeks. In this post, we're going to share a study we found that we think will interest you. We each decided that it described our own experience very well. We'd love to hear what you think. In a study published in the Journal of Family Nursing (2007), Linda Bell and colleagues at the Universite de Sherbrooke in Montreal studied family relationships in the first 4 months after the birth of the couples' first child. While the study was small (18 low-risk families), all of the parents consented to detailed interviews (60-90 minutes long) when their babies were 1 week, 6, weeks, and 16 weeks old. Mothers and fathers were interviewed separately. We think having these interviews take place at such pivotal ages was brilliant and the story told by the researchers hit home for all of us. Their findings describe how family relationships evolve, focusing on parents' experiences and perspectives at each time point. In the first week, parents were confused, stressed, trying to understand and relate to their babies. They ended up in survival-mode, trying to find ways to get through each day. The mothers talked about struggling to figure out how to keep baby happy and dads talked more about being fascinated with their babies' physical appearance ("he looks like us") and abilities. Because both parents were so confused about what to do with the baby, they relied on each other to help them guess what was best. They tried as best they could to "be on the same page" and work together to make sense of things. Neither parent had a set "role" or job. By the time the baby was 6 weeks old, parents had "figured out" their roles. Each parent could describe how they separately related to the baby. Parents (through negotiations or established routines) had developed "jobs" that belonged to them. Interestingly, moms tended to take on more jobs that involved direct infant care (not just feeding) and dads tended to have jobs that were more supportive or protective. Most of the dads in the study worked outside the home and it is likely that this separation made a difference in the outcomes. When discussing family relationships, the parents talked a lot about their new relationships with the baby but very little about their own relationship - as if the baby's needs had pulled them apart. As the babies reached 4 months of age, the parents were far more likely to see their family as a "unit" working together. 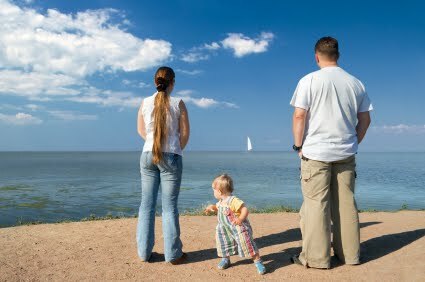 The "couple" had reformed and parents realized that their relationships with the baby were different, but complementary. Out of all the chaos and struggle, they discovered common goals and ways to reassure each other. Since their babies were old enough to interact and play with both parents, moms and dads were able to develop individual relationships with their babies while building a sense of themselves as a family unit. The parents also rediscovered each other. Happy ending, eh? While we know that this kind of harmony doesn't come quickly to every couple, we all remembered this evolution exactly as the authors described it. We hope that this study (and our perspective) offers hope to all of you who are still in those first few weeks wondering how you'll ever be able to manage it all. You will. You'll be pros in no time. Remember, talk things over, keep your sense of humor, ask for and accept help. For those of you beyond those early months, let us know if your experience was like ours. We'd love to hear from you. Reference: Bell, L. et al. Mother' and Fathers' Views of the Interdependence of Their Relationships with their Infant: A Systems Perspective on Early Family Relationships. Journal of Family Nursing 2007; 13: 179-200. Baby Behavior is on the Road! Time for a Parents Quiz!